The concept of a smartwatch was thrown around for a long time before the technology truly came to fruition. Through the pursuit of miniaturisation, modern smartwatches are sleek, compact, and remarkably capable for their size. Companies such as Apple and Samsung throw serious money into research and development, but that doesn’t mean you can’t create something of your own. [Electronoobs] has done just that, with this Arduino-based smartwatch build. The brain of the watch is that hacker staple, the venerable ATmega328, most well known for its use in the Arduino Uno and Nano platforms. An FTDI module is used for USB communication, making programming the board a snap. Bluetooth communication is handled by another pre-built module, and a smartphone app called Notiduino handles passing notifications over to the watch. This is a build that doesn’t do anything crazy or difficult to understand, but simply combines useful parts in a very neat and tidy way. The watch is impressively thin and compact for a DIY build, and has a host of useful functions without going overboard. 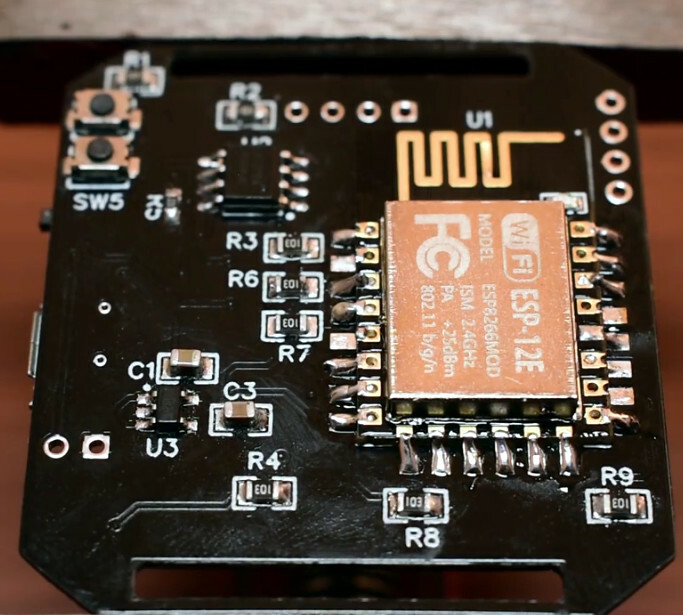 We’ve seen other DIY builds in this space, too – such as this ESP8266-based smartwatch. Video after the break. Most of the DIY smartwatch projects we feature here on Hackaday aren’t exactly what most people would consider practical daily-use devices. Clunky designs, short battery life, limited functions: they’re more a wearable display of geek cred than they are functional timepieces. Oddly enough, the same could be said of many of the “real” smartwatches on the market, so perhaps the DIY versions are closer to the state-of-the-art than we thought. But this ESP8266 smartwatch created by [Shyam Ravi] is getting dangerously close to something you could unironically leave the house with. It’s still missing an enclosure that prevents you from receiving PCB acupuncture while wearing it, but beyond than that it has a more than respectable repertoire of functions. It even seems to be a fairly reasonable size (with the potential to be even smaller). All that with a total build cost of less than $20 USD, and we’re thinking this might be a project to keep an eye on. Not content with a watch that simply tells the time, [Shyam] added in a weather function that pulls the current conditions for his corner of the globe from the Yahoo weather API and displays it above the time and date on the watch’s multi-color OLED display when the center button is pressed. Frankly, given the state of DIY watches, that would already have been impressive enough; but he didn’t stop there. The left and right buttons control Internet-connected relays which [Shyam] uses to turn his lights and air conditioner on and off. When he presses the corresponding button, the watch will even display the status of the devices wherever his travels might take him. A smattering of DIY watches pass by our careful gaze, though it’s been a while since we’ve seen an ESP8266 watch. More recently we’ve seen an Arduino watch, and some downright gorgeous analog creations. The heart! A pump of the most fantastical kind, it is capable of operating for decades without rest. It’s responsible for supplying vital oxygen to the body’s subsystems, and can be readily monitored with modern technology. [Dave Vernooy] wanted to build a watch that could take heartrate and blood oxygen measurements – so he did. Named Heartwatch, the device is a DIY smartwatch build with a bunch of exciting features. Heart monitoring is taken care of by the MAX30102 sensor which integrates all the hardware to sense heart rate and oxygen saturation into a single tiny plastic package. There’s then an assortment of accelerometers, gyros and even a color LCD to display all the wonderful information. It’s all wrapped up in a 3D printed case, with an ATMEGA1284 running the show. The project just goes to show how much can be achieved with an 8-bit processor – there’s not always a need to run a high-powered ARM chip for an embedded project. There are a fair few DIY smartwatch builds out there – like this classy unit with an OLED screen. In the 1950s, artwork of what the future would look like included flying cars and streamlined buildings reaching for the sky. In the 60s we were heading for the Moon. When digital watches came along in the 70s, it seemed like a natural step away from rotating mechanical hands to space age, electrically written digits in futuristic script. But little did we know that digital watches had existed before and that our interest in digital watches would fade only to be reborn in the age of smartphones. In 1883, Austrian inventor Josef Pallweber patented his idea for a jumping hour mechanism. At precisely the change of the hour, a dial containing the digits from 1 to 12 rapidly rotates to display the next hour. It does so suddenly and without any bounce, hence the term “jump hour”. He licensed the mechanism to a number of watchmakers who used it in their pocket watches. In the 1920s it appeared in wristwatches as well. The minute was indicated either by a regular minute hand or a dial with digits on it visible through a window as shown here in a wristwatch by Swiss watchmaker, Cortébert. The jump hour became popular worldwide but was manufactured only for a short period of time due to the complexity of its production. It’s still manufactured today but for very expensive watches, sometimes with a limited edition run. The modern digital watch, however, started from an unlikely source, the classic movie 2001: A Space Odyssey. We’re not sure what to make of this one. With the variety of smartwatches and fitness trackers out there, we can’t be surprised by what sort of hardware ends up strapped to wrists these days. So a watch with an RPN calculator isn’t too much of a stretch. But adding a hex editor? And a disassembler? Oh, and while you’re at it, a transceiver for the 70cm ham band? Now that’s something you don’t see every day. The mind boggles at not only the technical prowess needed to pull off what [Travis Goodspeed (KK4VCZ)] calls the GoodWatch, but at the thought process that led to all these features being packed into the case of a Casio calculator watch. But a lot of hacking is more about the “Why not?” than the “Why?”, and when you start looking at the feature set of the CC430F6137 microcontroller [Travis] chose, things start to make sense. The chip has a built-in RF subsystem, intended no doubt to enable wireless sensor designs. The GoodWatch20 puts the transceiver to work in the 430-MHz band, implementing a simple low-power (QRP) beacon. But the real story here is in the hacks [Travis] used to pull this off, like using flecks of Post-It notes to probe the LCD connections, and that he managed to stay within the confines of the original case. There’s some real skill here, and it makes for an interesting read. And since the GoodWatch is powered by a coin cell, we think it’d be a great entry for our Coin Cell Challenge contest. While the current generation of smartwatches have only been on the market for a few years, companies have been trying to put a computer on your wrist since as far back as the 80s with varying degrees of success. 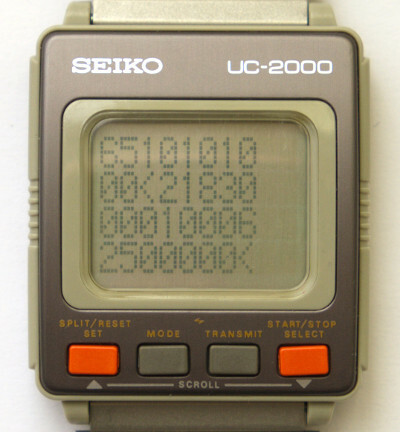 One such company was Seiko, who in 1984 unveiled the UC-2000: a delightfully antiquated attempt at bridging the gap between wristwatch and personal computer. Featuring a 4-bit CPU, 2 KB of RAM, and 6 KB of ROM, the UC-2000 was closer to a Tamagotchi than its modern day counterparts, but at least it could run BASIC. Ever since he saw the UC-2000 mentioned online, [Alexander] wanted to get one and try his hand at developing his own software for it. After securing one on eBay, the first challenge was getting it connected up to a modern computer. (Translated from Russian here.) [Alexander] managed to modernize the UC-2000’s novel induction based data transfer mechanism with help from a ATtiny85, which allowed him to get his own code on the watch, all that was left was figuring out how to write it. With extremely limited published information, and no toolchain, [Alexander] did an incredible job of figuring out the assembly required to interact with the hardware. Along the way he made a number of discoveries which set his plans back, such as the fact that there is no way to directly control individual pixels on the screen; all graphics would have to be done with the built-in symbols. The culmination of all this hard work? Playing Tetris, naturally. Though [Alexander] admits that limitations of the device’s hardware meant the game had to be simplified a bit, he’s almost certainly having more fun than any of the UC-2000’s original owners did with this device. He’s setup a GitHub repository for anyone who wishes to join him in this brave new world of vintage wrist computing. [Alexander] isn’t the only one experimenting with fringe wearable computers. We’ve seen our fair share of interesting smartwatches, featuring everything from novel input methods to complete scratch-builds. [Max K] has been testing the battery life of his self-designed watch under real-world conditions. Six months later, the nominally 3 V, 160 mAh CR2025 cell is reading 2.85 V, so the end is near, but that’s quite a feat for a home-engineered smart watch. We’ve tipped our hats to the Chronio before in this Hacklet, but now that the code is available, as well as the sweet 3D-printed case files, it’s time to make your own. Why? It looks sweet, it plays a limited version of Flappy Bird (embedded below), and six month’s on a button cell is a pretty great accomplishment, considering that it’s driving a 96×96 pixel LCD display. The Chronio is more than inspired by the Pebble watch — he based his 3D model directly on theirs — so that’s bound to draw comparisons. The Pebble is color, and has Bluetooth and everything else under the sun. But after a few weeks away from a power socket, ask a Pebble wearer what time it is. Bazinga!